With the last couple Saturdays being on the right chilly side, we have been inside a bit more than we would like! But that’s okay, we do keep busy! Maggie has really been making some neat things in her work shop for us! 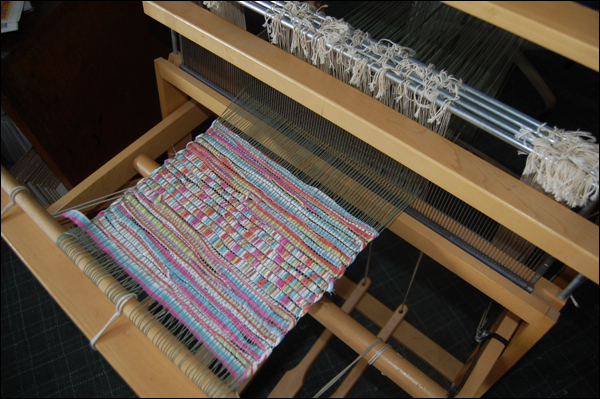 Like this card weaving loom. It’s pretty neat! 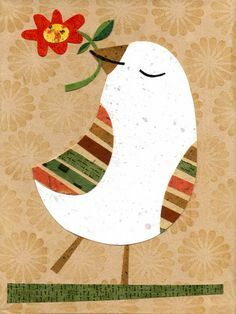 Simple design, but sometimes those are the best! And it works like a champ. 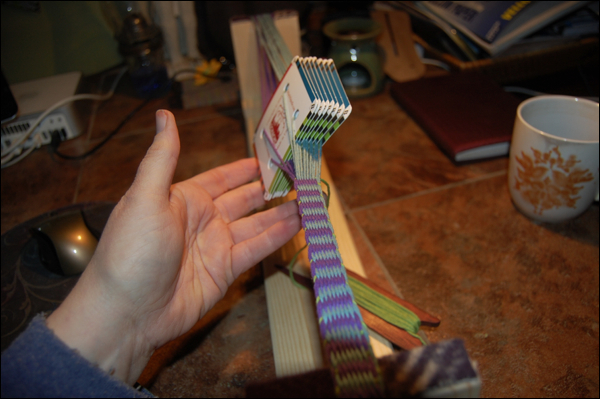 I ordered a set of weaving cards off Etsy, but I think you could make your own pretty easily. These were only $6 so I thought it would be nice to use them. 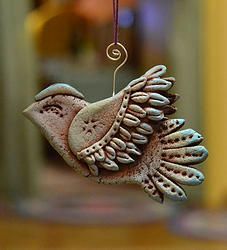 Support another little Etsy shop owner! I haven’t done anything too complicated yet, but it’s enjoyable. 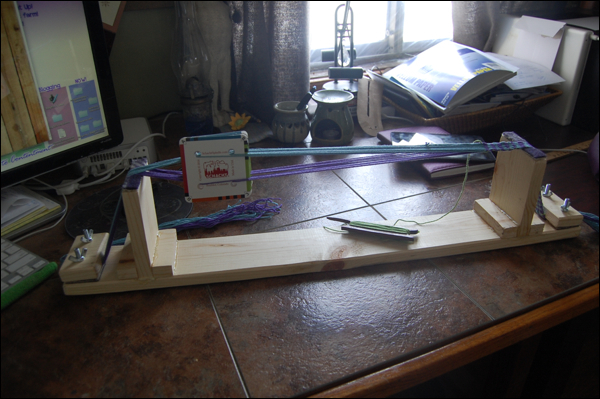 I think I like the inkle weaving a bit more, but then I haven’t give this artform a good run yet. You can make some very fancy bands and designs when you use more card and different colors of yarns and such! Jess got the little loom we call Ikea up and warped… it does such a nice job! 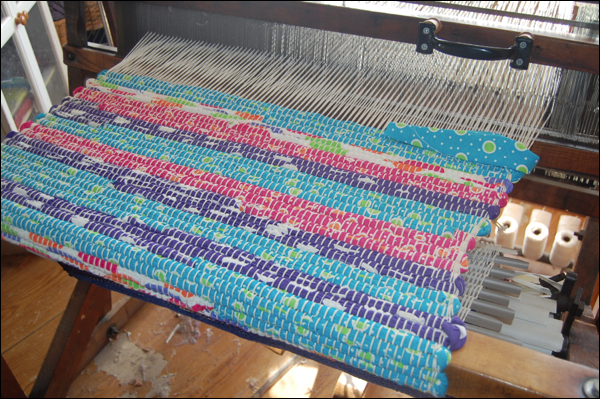 We love weaving on it… Just some fun colorful scrap weaving at first! 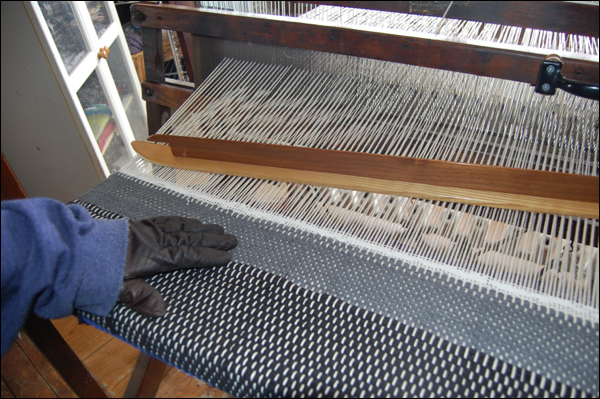 The big studio is still REALLY chilly, but I wanted to do some weaving, so I just got on my gloves and went to town! Maybe someday we can get another little portable kerosene heater or something for those really cold days. Right now, the gloves were just the touch I needed to stay tolerably warm. I love how this rug came out, it is made from old t-shirts cut into strips! I’ve been trying to weave through my stash so that come garage sale season, I can give myself permission to buy up some new fabrics and such for rugs! 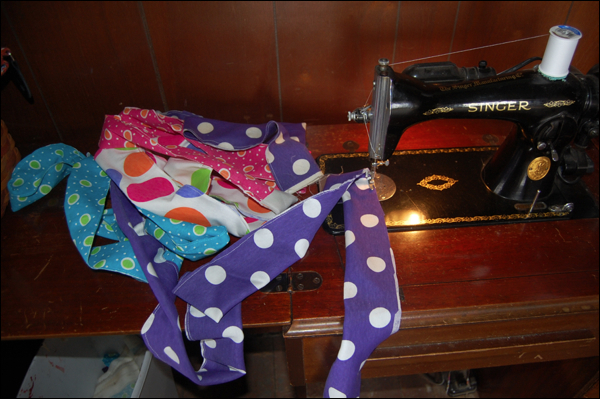 And I have had this clown costume fabric for about a year now. A reader friend sent it to me from her stash and I tried weaving with it then but it wasn’t working well. Because it has nearly a white background, the colors were not staying near the outside and it was just troublesome. But it was so colorful, I couldn’t just pass with it. And then, it finally came to me! Make tubes! 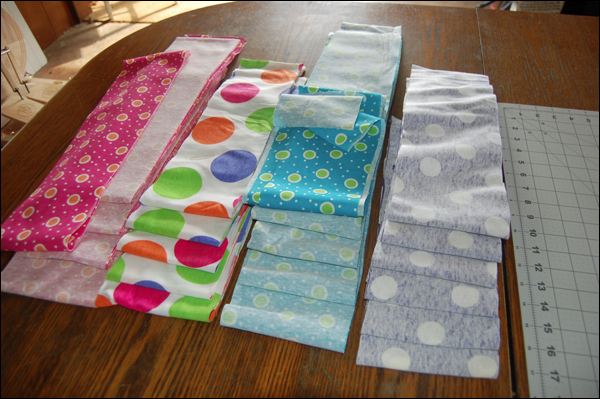 So I cut it nice and neatly with my rotary cutter, about 5 inches wide… and then I folded the strips together and stitched the side seams super close to the edge. At first I was going to do it like a regular tube and then pull the inside, out, but that would have been days! So I compromised, and did it with just a wee seam on the side and it was perfect. It wove pretty nicely and I really like the end product! A very fun and tough rug… don’t you think it would be adorable in a kid’s room? 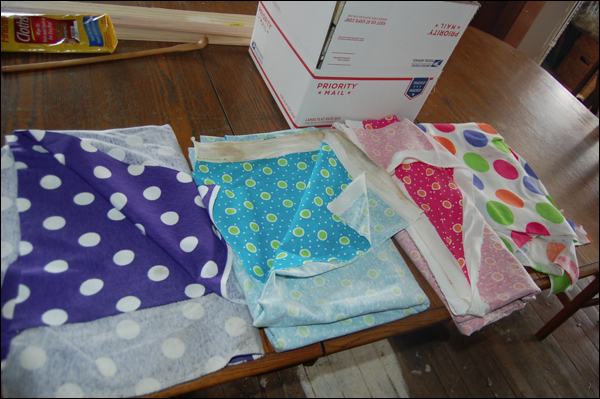 I think I will remember this for when I find fun big fabric that might not work as well as just vintage sheets and such. It was a little more work then normal, but it wasn’t too bad at all. 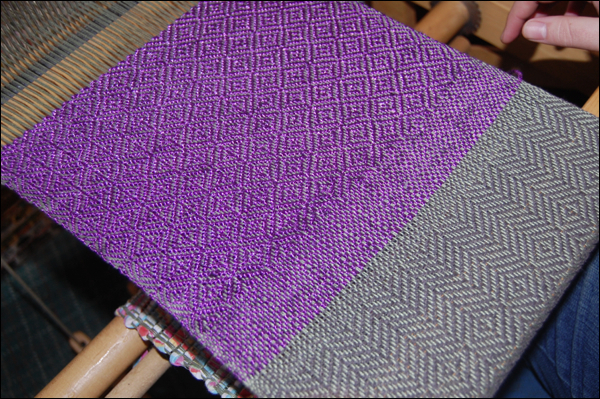 Jessy got to weaving some beautiful cloth on Ikea! 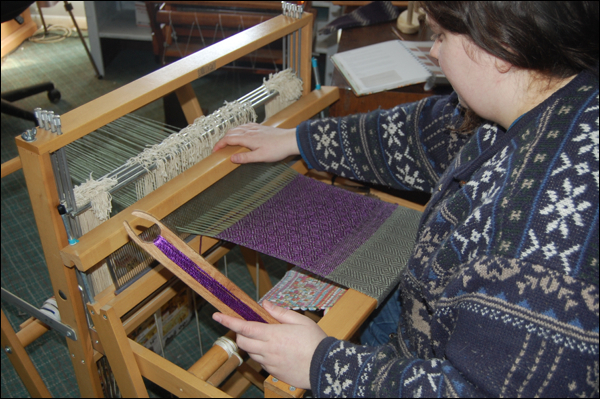 (We called her that because she is a Swedish Ulman loom that folds all up and such! haha… reminded us of the Ikea packaging and products) We really like this little loom. Nice, portable, and easy to take with us to shows and demonstrations. She weaves about 18 inches wide, if I remember correctly. Nice tension, great little loom. 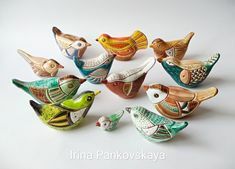 When we can, we would like to get a finer reed for her. Right now it’s a 6 dent reed… and that is pretty huge. we end up double warping her. Even the big rug loom is 15 dent… and the old Margaret loom is even finer. It’s on the wish list and we will be keeping our eye out for one. 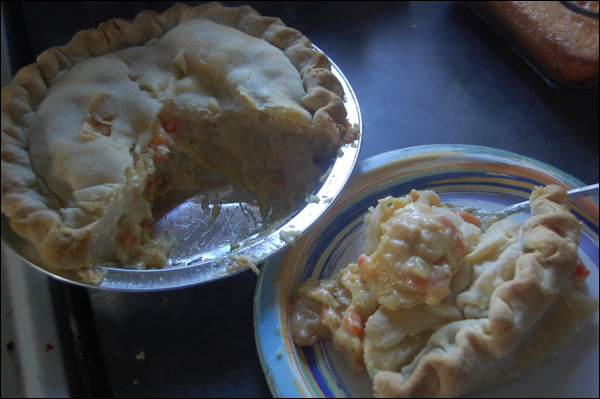 We finished the weekend with a yummy homemade chicken pot pie! What can be better? 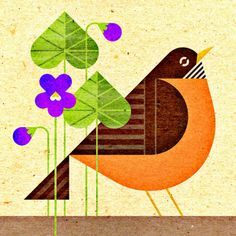 I know spring is around the corner and then we will be back to working outside and just enjoying the lovely temperatures, the critters and the SUNSHINE!!! But until then, we are keeping busy and just working away the time. That is a fabulous way to spend inside. 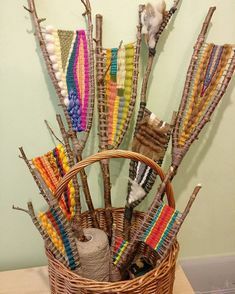 You all do some gorgeous weaving. i agree that Jessie’s work on the Ikea is just fabulous. 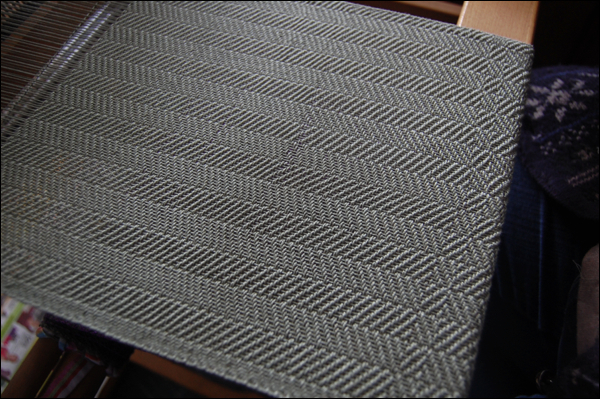 Looks looks a good width for placemats!